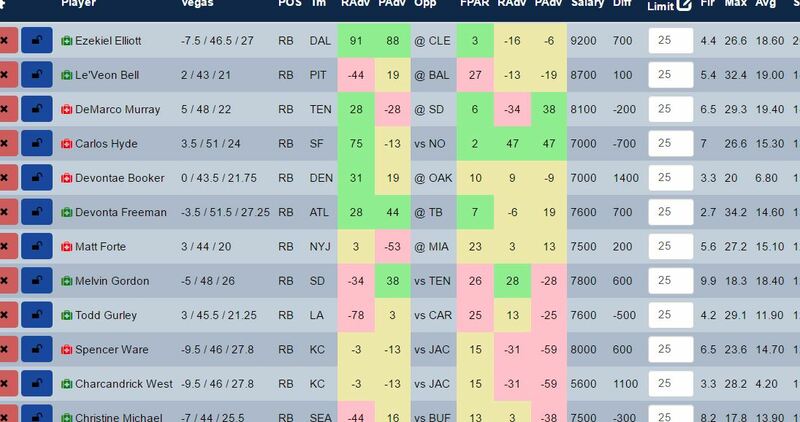 Are you wondering who the best FanDuel running backs are for week 9? We're going to look at the top 11 based on projections and break that list down to my top four picks based on matchup. Our RAdv (rush advantage) and PAdv (pass advantage) ratings allow us to determine how much success a team will have versus their opponent. Based on FPAR (fantasy point allowed rankings),RAdv / PAdv and projections I have a decent estimate of upside. From there I consider things like game flow, Vegas odds and recent team injuries. Okay, here we go! FanDuel Week 9 Running Backs. Build better lineups with the best optimal lineup tool. Charcandrick West: I doubt Ware plays this week. This trust Charcandrick West into the top four running backs on FanDuel list. His salary sits at a mouth watering $5,600 and despite the mildness of RAdv and FPAR he's a solid option. Devonta Freeman: T. Coleman has already been ruled out for week 9 so I'm staying on the Freeman bandwagon. Tampa can't stop (anything) the run and the favorable O/U makes me think about all the red zone opportunities in Freeman's future. Ezekiel Elliott: He's worth paying up for this week as we should see multiple touchdown coming his way vs the Browns. Sidenote here, the Cowboys are will be without their top DB and S this week. Cleveland could actually make this game interesting. Just another reason I like Elliott. Carlos Hyde: His price is down $700 from last week and he's in one hell of a sweet matchup. Obviously we're only recommending him for GPP, not cash games. Le'Veon Bell has a bad matchup. Normally he's matchup proof but Vegas has this game projected as a low scoring affair and our Adv ratings show PIT having much more success via the air. I think this limits his overall upside and makes him a cash game only play. I just recommended Carols Hyde but I'm about to backtrack on you here. Dannelle Ellerbe is back and should play many more snaps this week. He's a big upgrade for New Orleans versus the run and this could impact Hyde enough to fade him. 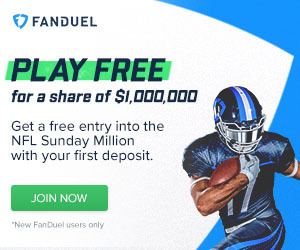 You should probably limit your exposure here which you can do when building FanDuel lineups with our tool. DeMarco Murray is battling a toe injury. This is like water on a witch or better yet, superman's kryptonite. Keep an eye on his status during and after week 9's game. Better yet, if you have space on your bench add Derrick Henry now (yes I just added seasonal advice to a DFS piece - sue me).